If you want insights into the history of Claudia Paz y Paz, former attorney general of Guatemala (2010-2014), and what she symbolizes, look no further than the recent six-part series of reports from Steve Hecht and David Landau. These two men put painstaking work into unraveling the disparity between this woman’s image as a human-rights academic with Georgetown University in Washington, DC, and the reality on the ground back in Central America. In particular, they detailed how she represents a continuation of the Marxist push for control over Guatemala, dating back to the multi-decade civil war, which on paper ended in 1996. Despite military defeat and minimal support at the polls, Hecht asserts, they simply changed tactics and sought to infiltrate the government through the backdoor, and that’s how Paz y Paz came to power. Perhaps what disappoints him most is that many wealthy and powerful people in Guatemala have chosen to work with the guerrilla, and get protection from them, rather than oppose such a takeover. [Thus] the indigenous people are, today, subject to basically guerrilla control.… These NGOs, created by the former subversives and financed mostly by Europe and given political backing by the Obama administration… They force them through criminal actions to support their agenda, which includes blocking roads, which includes kidnapping, which includes not letting police come into areas.… They have clandestine prisons; they have forced labor … and nobody pays attention. Hecht covered a lot of ground in half an hour of interview, but afterwards he wrote that he regretted not addressing the relevance to people in the United States. He also believes Colombians have much to learn from Guatemala’s struggles, as they grapple with their own malignant FARC guerrilla. His primary concern is that US media fail to even address foreign policy towards Guatemala. The few who do, he says, lend support to Marxist insurgents, be that unwittingly or not. On the other hand, ideological adversaries of the guerrilla and the Obama administration tend to avoid the issue as something they do not understand. We believe that the actions of the Obama administration here shed much light on their domestic policies and politics, and that the US public has been deprived of this information … which is one of the reasons Obama can so blatantly intervene in Guatemala to the detriment of the people of the United States. Find more of Hecht’s work with the Liga ProPatria Foundation, which advocates for the rule of law in Guatemala. 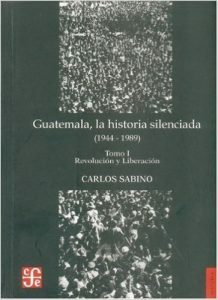 Hecht also recommends, for Spanish readers, a book by historian and sociologist Carlos Sabino of Francisco Marroquín University: Guatemala, la historia silenciada (1944-1989). Hecht supports open debate, particularly on university campuses, and he would like to see a dialogue at Georgetown University over whom they have selected as their “distinguished scholar in residence.” Further, he was glad to spar with Luis Eduardo Barrueto, who wrote a letter to dispute the report series. Read: “In Defense of Claudia Paz y Paz,” which includes a response from Hecht. This interview first appeared in the PanAm Post.